When hiking the Grinnell Glacier Trail in Glacier National Park, you really do get some incredible views. This particular photo was taken from along the trail and looks down on Grinnell Lake. The "milky" color of the lake is due to the melting of the Grinnell Glacier. Although the Grinnell Glacier is far above Grinnell Lake in terms of elevation, the melting water spills down in Grinnell Lake (you can even faintly see the "white inflow" on the bottom right of the photo). As the water from the melting glacier has no nutrients and is very cold, Grinnell Lake is fishless and has this peculiar color (due to mineralization, I'm told). 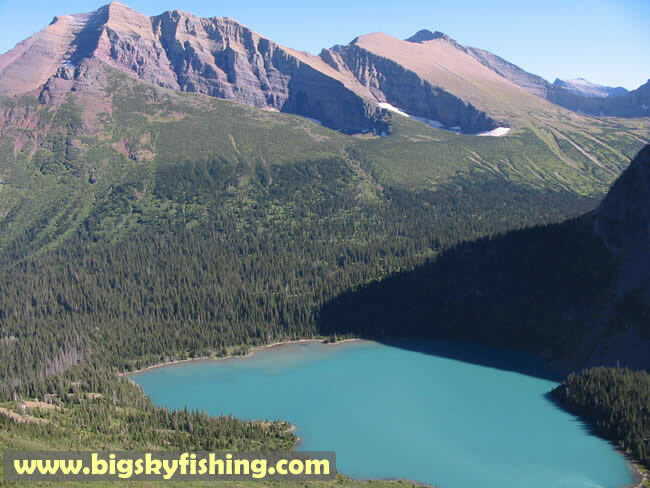 Once the Grinnell Glacier has completely melted away - or at least most of it - it is likely that Grinnell Lake will begin to be able to support fish in time - like most of the other lakes do in Glacier National Park. Allen Mountain is the tall mountain in the distance.